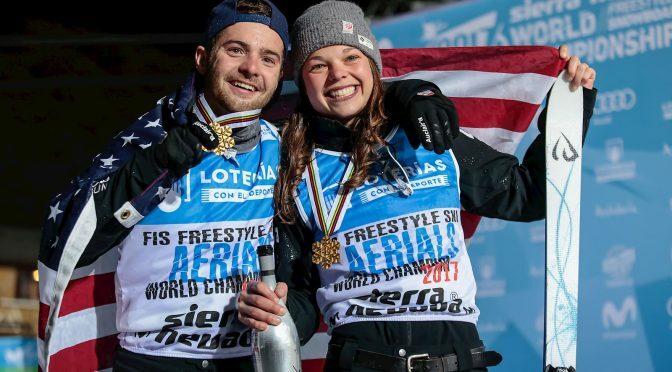 Sierra Nevada, Spain – As her plane approached Malaga on the southern coast of Spain, Ashley Caldwell reflected on the World Cup season. 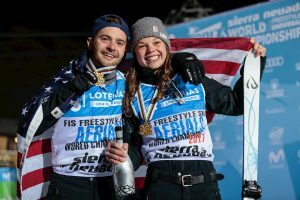 It had been nearly three months since she opened defense of her World Cup aerials title in China. It wasn’t a great weekend. And it had been a rugged season since. It was time for a fresh start. The World Cup season ended a week earlier in Belarus. Now it was on to World Championships – one competition, one chance to prove that she was best in the world. A year earlier, Caldwell had won the crystal globe. This year the lone highlight was a hometown victory at Lake Placid in January. It was frustrating for the now 23-year-old who had broken through as the youngest Olympian (16) on the 2010 team and as the only woman on the tour regularly throwing triple flips. But she had something else up her sleeve for Sierra Nevada, a sprawling resort with vast snowfields above the tree line nestled up a twisty-turny mountain road from Granada. As an athlete, you want to win. But you also want to progress your sport. For years, Caldwell had been pushing her coaches on triples – higher degree of difficulty, higher points, but greater prospect for failure. But if you don’t take a little risk, you’re not moving forward. She was a solid triples skier – three flips and three twists – but she wanted more. She wanted to land The Daddy! On the first day of training at Sierra Nevada, officials split sessions by jump – double kicker and triple kicker, more or less women and men. Caldwell went for the triple, training side-by-side with the men. She got into it quickly, ramping up to her higher level DD sooner than anyone. Then she threw The Daddy. Jaws dropped on the coaches’ knoll. Word spread around town. She had just landed a triple flip with four – not three – twists. It was a jump women just didn’t do. What makes The Daddy so difficult is the addition of a second twist on the second flip. It’s one of the most difficult maneuvers in freestyle aerials. It’s evolution dates back to the mid-80s and the early days of the sport. Canadians Yves Laroche and Jean Marc Rochon, early pioneers of the aptly-named Quebec Air Force, were among the first to perfect it. American Trace Worthington threw it to win World Championships in 1995. But these were guys! The only woman to attempt it in competition was Lydia Lassila, who closed out the 2014 Sochi competition with it, only to slap back on landing. Still, with the DD points it carries, she took bronze. On qualifying day, she threw a full-full-full – three flips, three twists. It’s a tough trick but one she has down. She led the field. In her first of three jumps Friday evening, Caldwell went with a lay-full-full – three flips with two twists. At the Olympics in Sochi she opened with lay-tuck-full – not as high a DD and little room for error if you made a mistake, which she did. And her day was over. With that lesson, she stepped up the DD for World Championships. And she moved on to the next round. Now it was go time. She ramped it up to full-full-full and nailed it, leading going into the final round. You couldn’t repeat a trick. So all she had left in her portfolio was The Daddy. She was now forced into using it to go for gold – all part of the plan. It was night time in Sierra Nevada. Caldwell stood at the top peering down into the darkness. She was the very last athlete to go. She knew precisely what to do. Her eyes drew a fix on coach Matt Saunders on the knoll. He gave her the sign. Now, the sport of freestyle aerials skiing was in her hands. She was scared – very scared. But focused. She made her hop turn into the inrun. At that point her sound of sssssssssswoosh broke the night silence as she approached the kicker. In her mind she thought about her quads, her core, her eyes and every technical aspect of the intricate trick. She hit the kicker, launching nearly 70 feet into the air. This was the critical moment of the jump. A week earlier in Belarus she messed it up and actually did the wrong trick. This was the moment that would determine if she would win gold or go home. Up into the air she soared. Flip and twist. Flip and double twist. Flip and twist. It was precision. A little form break on the third flip and a landing that wasn’t perfect. But she landed it. And it was golden. Her teammates mobbed her in the finish. Then they stepped aside to watch the guys. Now, it was Jonathon Lillis’ turn to take gold – motivated by Caldwell, he nailed his first major international podium.